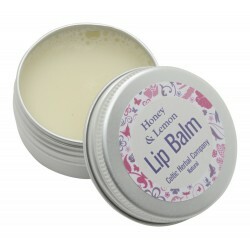 Soothe and protect your lips from the elements with this 100% natural honey and lemon lip balm. The handy sized pot is perfect to keep in your handbag or at the office. Castor (Ricinus communis) seed oil, Coconut oil (Cocos nucifera), Beeswax (Cera alba), Sweet almond oil (Prunus Amygdalus Dulcis), Lecithin, Honey (Mel), Calendula (Calendula officinalis) flower extract, Tocopherol, Lemon (Citrus Meolica Limonum) oil. Allergens - Citral, Limonene.